Lighten up a Thanksgiving classic with this naturally sweet and creamy Sweet Potato Carrot Casserole that’s full of flavor and nutrition. Topped with sweet and crunchy maple pecans, I promise you won’t miss the marshmallows! This recipe originally appeared in the November 2016 issue of Today’s Dietitian Magazine. I was compensated for writing the original article, “Sweet Potatoes + Carrots,” and developing the recipe, but I was not compensated for sharing the column or magazine with readers on my blog. All opinions are my own. I may have mentioned this once or twice before, but it bears repeating – Thanksgiving is my favorite holiday. I love everything about it: the casual day at home hanging out with family, the tradition we have of going around the table saying what we’re thankful for, and of course the aroma that envelops the house as we cook all our traditional Thanksgiving dishes. Some of my favorite Thanksgiving recipes include my Spiced Pumpkin Bread, Roasted Butternut Squash and Sweet Potato Soup, roasted Brussels sprouts, Orange-Ginger Cranberry Sauce, roasted turkey (of course! ), Roasted Butternut Squash and Cranberry Quinoa Salad, and sweet potato casserole. I’m actually not the biggest fan of the classic marshmallow-topped sweet potato casserole, but my husband is so in the past I’ve made two casseroles – one with marshmallows and one without. The problem with most of the sweet potato casseroles you find recipes for this time of year is that they’re often more like dessert than a savory side dish. Between the butter, brown sugar, marshmallows, and number of eggs used in the casserole, you quickly have a side dish that’s a disaster for your waistline. Don’t you want to have room for all the other amazing side dishes on the menu? And you definitely want a bite of that apple crumble or cranberry upside down cake waiting on the dessert buffet! You’re in luck, because I’m here to help! This Lightened-Up Sweet Potato Carrot Casserole with Maple Pecans is a nutritious and delicious makeover of the classic recipe you know. It’s naturally sweet and creamy, it’s full of flavor and nutrition, and it’s a winner with the whole family – kids included! Sweet potatoes and carrots are the stars of the show here. It should come as no surprise to you that I roast them to bring out their natural sweetness and then they get pureed with freshly squeezed orange juice and zest, creamy coconut milk, and warming spices including ginger, cinnamon, and nutmeg. All these ingredients add so much flavor without overdoing it on fat, calories, sugar, and sodium. Plus, these ingredients keep the recipe dairy-free, egg-free, and gluten-free – so there’s something for everyone on the Turkey Day table! The only added sugar you’ll find in this sweet potato carrot casserole is in the maple pecans sprinkled on top, and with that there’s only two teaspoons of maple syrup. That sure is a lot less than the 1/2 cup of sugar found in many sweet potato casseroles that come up in a Google search (and that’s not including the marshmallows!). The maple pecans are a sweet and crunchy topping that provides a nice textural contrast to the creaminess of the casserole. Plus pecans are a good source of healthy monounsaturated fats and they add some more fiber to the dish. You definitely won’t miss the marshmallows here and you’ll save room for an actual dessert – not just a side dish imposter! This Thanksgiving, give this easy (and better for you) sweet potato carrot casserole a place on your holiday table. It’s sure to satisfy everyone’s tastebuds and may even start a new tradition – lightened-up Thanksgiving recipes everyone loves and can feel better about enjoying! Now that’s something to be thankful about! Sweet potatoes and carrots are roasted and then puréed with flavorful spices to produce a naturally sweet and creamy base for a lightened-up version of the classic Thanksgiving casserole. It’s topped off with maple pecans that add some crunch and sweetness and still leaves you room for dessert! Preheat oven to 400° F. Line large baking sheet with aluminum foil. Coat a 9x13-inch baking dish with cooking spray and set aside. Toss sweet potatoes and carrots with olive oil and spread on baking sheet. Roast 30 minutes until caramelized, stirring once or twice during cooking. While vegetables are roasting, in a small bowl toss pecans with maple syrup and set aside. When vegetables are finished cooking, remove from oven and reduce oven temperature to 350° F.
Transfer roasted vegetables to a large food processor; add ginger, orange zest, orange juice, and coconut milk, and process until smooth, scraping down the sides of the bowl as necessary. Add cinnamon, nutmeg, salt, and pepper, to taste, and process again until blended. Taste and adjust seasoning as desired. 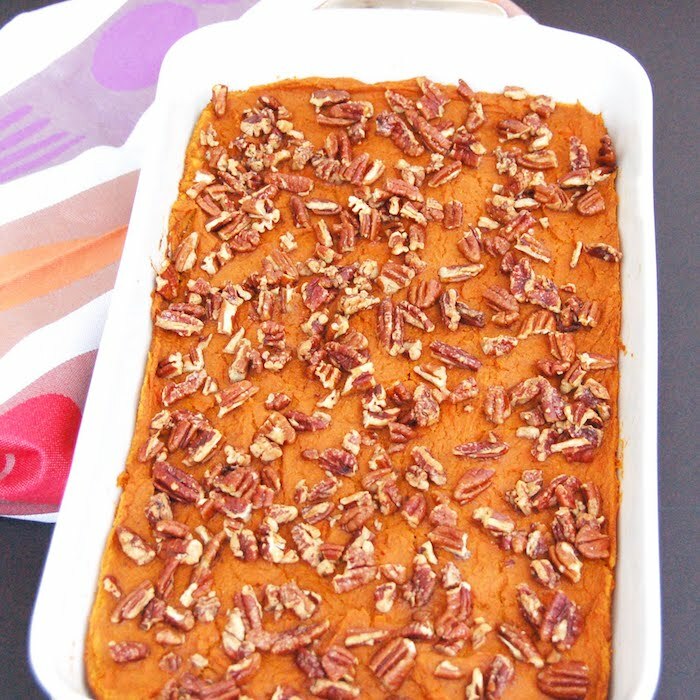 Spread the sweet potato carrot purée in the prepared baking dish and sprinkle with prepared pecans. Bake until hot and beginning to brown around the edges, 40 minutes. 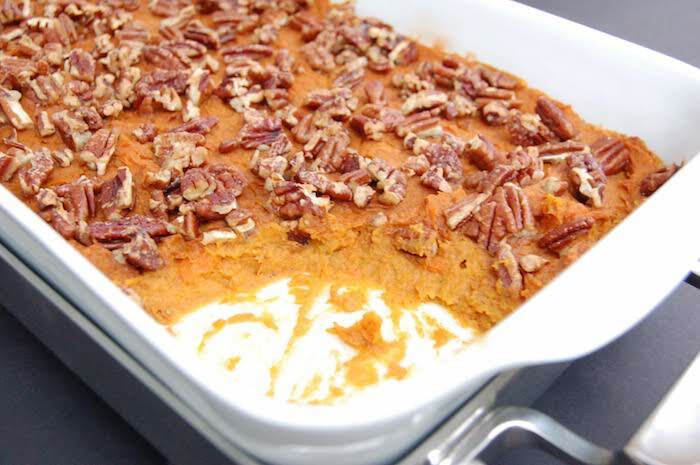 Is sweet potato casserole on your Thanksgiving menu? Do you have a holiday recipe makeover you’d like to share? My thoughts exactly. I had to take that side and turn it into a dessert since I think it’s too sweet. Can’t wait to give this a try! I really never understood the whole marshmallows on sweet potato casserole thing as a side dish anyway! Hope you give this more savory side a try! What usually gets me is all the added butter and sugar. I can do marshmallows and sweet potatoes for a dessert or more balanced but not with all the sugary heaviness. Yes can’t wait to try them, I sent them to my cousin who usually makes them. Yeah, all the butter and sugar is just unnecessary! Can’t wait to hear what you and your cousin think! Everything about this I love! I can’t wait to get the TD magazine so I can read your great contribution! I love the addition of orange zest ad the OJ. I think it sounds delightful! This looks so much better than the version I grew up on (loaded with brown sugar and even marshmallows – eek!!) The crunch on the top is PERFECT! Thanks so much Chrissa! The pecans add such a great balance of textures! Enjoy. I have to admit I love the sweet potatoes with marshmallows! But otherwise I just sweeten with orange juice and we make them only on Thanksgiving! But I also love them topped with pecans. I love your genius idea to blend carrots in. We’re super excited to be hosting our first Thanksgiving in the new house! I never would have guessed that Kaleigh! I think that’s the first difference in our tastes that I’ve found, lol! That is so exciting you’re making your first Thanksgiving. Can’t wait to hear about your menu! Love this lightened up version! Perfect for Thanksgiving! Thanks so much Lindsay! I hope you give it a try! haha, right?! Casseroles get a bad rap, but they are delicious, especially when made healthier! Thanks so much Amanda – hope you enjoy it and happy Thanksgiving! Looks like a delicious casserole! Thanks Amy – it is!! Hope you give it a try! Thanks Marie! Hope you get a chance to try it out! Happy Thanksgiving! Love the blend of carrots and sweet potato in this dish. And how could I resist the maple pecans. Sounds scrumptious! Thanks so much Lauren! Hope you get to give it a try! My favorite Thanksgiving side dish! I LOVE the maple pecans…YUM! Thanks so much Laura! And so glad to hear it’s one of your faves! I can just tell by looking at the ingredients that this is just as delicious as it sounds! No need to wait for the holidays on this one! Thanks Alisa! I certainly haven’t been waiting – been enjoying it since the start of fall! My Mom’s classic recipe was a brown sugar, butter and marshmallow feast… and I have to admit I’m a fan. But JUST on Thanksgiving. This is the kind of dish you could feel amazing eating any day. Love the light coconut milk and orange zest in it. I bet it makes it so bright!!! LOVE! I bet your mom’s recipe is amazing! But, yes, more of a splurge, whereas this one is definitely one I will eat on repeat all fall and winter long! This looks awesome!! Sweet potatoes are one of my favourites and I love the sweet ‘tader carrot combo here. And those pecans!! Thanks Rebecca. I love combining foods I love in one dish! And yes, those pecans are pretty great! 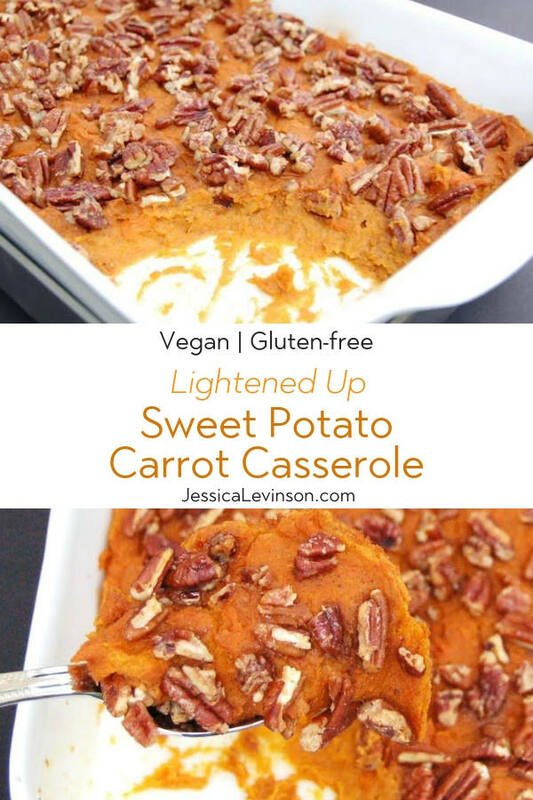 I have never added carrots to my sweet potato casserole but plan to do it now! Plus using a food processor is genius – no more mashing for me! Loving this healthy twist! 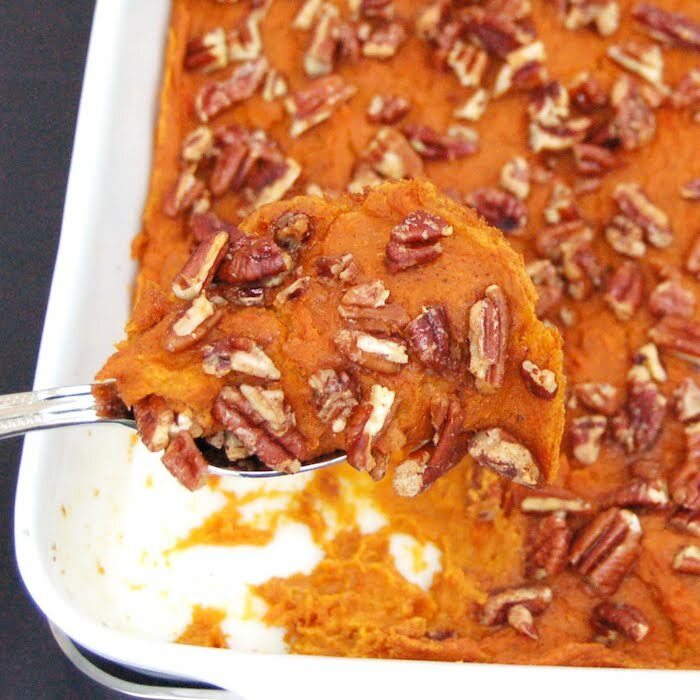 Finally a sweet potato casserole where the main focus is the veggies and not the added sugar! Thanks so much Julie! Yay for more veggies and less sugar! Mmm this looks like the perfect side for any occasion! This looks delicious! I haven’t had a sweet potato casserole with carrots! Thanks Carmy. hope you try it! This sounds so good! Sweet potato casserole is my favorite, and the carrots in it is new for me! I definitely want to try this! Without belittling your knowledge and striving for healthy living I must defend the loaded with brown sugar, marshmallow and butter sweet potato casserole. The sugary casserole has been a staple during the holidays since before I was born. There is something about the balance of the sugary casserole that brings out the combined taste of Turkey, Ham and other holiday servings. It is the one thing that will vanish before all else on the holiday menu. I agree it is not a health based recipe but I also believe the complementary taste of the food with other menu items accents the festivity of our holiday seasons. Everyone who has eaten our casserole agrees on one thing, it is delicious and should be consumed as a special dish. Don’t overdo the eating and your health will continue to be what all your other foods make it. Thanks for sharing your thoughts Monty. There is definitely room for both types of casseroles on the Thanksgiving buffet. Personally I find the classic one too sweet and more like dessert, but to each his own. I am all for moderation and enjoying what you love! Sounds like a great receipe! Do you have any thoughts on an alternative topping? I’m allergic to nuts but I like your idea of having something crunchy to contrast the creaminess. Maybe granola? Not sure how that would go with the other flavors though. Thank you so much in advance! Thanks Safa! I think granola could work well. I would do a combination of oats, pumpkin seeds, maybe even some quinoa tossed with some oil and maple syrup then baked until crispy before you put it on top. Would love to hear if you try it!